Twin Peaks. The drama. The flannel. The unearthly blend of mawkish and surreal that could only come from the dark, dark mind of one David Lynch. And, of course, the pie. I'm not sure exactly how watching the weekly adventures of The Bookhouse Boys, Agent Dale Cooper, the Log Lady and the rest of the gang as an adolescent warped my mind, but I think it was in a good way. Nobody's ever figured out how the TV execs agreed to let Lynch loose on prime time, but thank god they did. The first season is some of the best TV ever. The second season... well, really, it's kind of a mess but still miles more interesting and original than 99 percent of the crap on television. 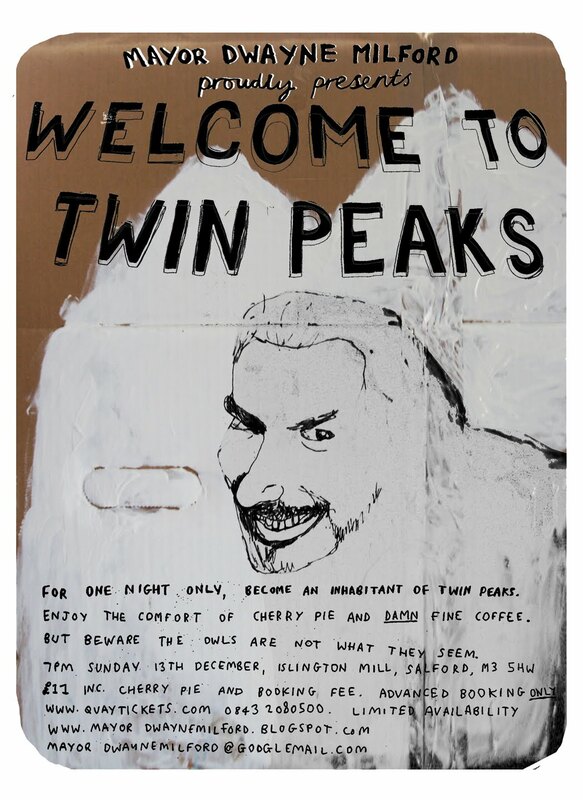 If you've always secretly longed to don Laura Palmer's prom dress, you're in luck: Islington Mill in Salford will be turned into the town of Twin Peaks for one night only on Sunday Dec 13. Come in character. There will be a Miss Twin Peaks 2009 pageant, live music, performances and djs. £11 (advance only here, limited capacity) gets you in with a slice of cherry pie. I'm also going t'mill tonight to catch the amazing Mayming and World Sanguine Report. Some really great gigs coming up there. Club Brenda, the big hearted club night renowned for its eclectic playlist, is the subject of a limited edition book. Strange Trees. The book is getting a proper DJ-assisted launch Dec 1 at Urbis 7:30-10 (free entry). The book "moves through the history of Club Brenda, using a series of classic narratives to form a dark urban fairytale, alongside a series of commissioned photography and artwork" from the likes of Rachel Goodyear and David Hoyle, who will also be selling art on the night. Enjoy your Urbis while you can, kids. And closer to home (well, for me and those of us who live in the farthest reaches of North Manchester, much further for everyone else) Horse & Bamboo's Deep Time Cabaret comes to the Boo in Waterfoot on Saturday, 28 November. Looks like fun.